Anyone can visit Epcot; swift Whippet Leah Robbins (and others) had another agenda… Read on! I can’t think of a better way to visit the Wonderful World of Disney than by running through the parks at 5:30 in the morning (2 days in a row…). The decision to run the “Goofy Challenge” in 2015 was informally made on the west side highway during a shake out run with fellow Whippet Francesca [DeLucia]. We said, we were going to do it, and we did! I was very excited for my very first “run-cation” and non NYC marathon, but was very unsure about how a full marathon would feel 24 hours after running a half? Seems sort of crazy, right? What was nice though, was that I truly felt no pressure or stress! I told myself over and over that it was a fun run. Day 1 begins for me, Francesca and Alex [London] at 2:45 AM. We took a very efficient shuttle from our hotel to the start where we froze our butts off for a good hour. By 5:30 am fireworks go off and I settle into a nice, comfortable, pace. About a half mile into the run I see a “Team for Kids” jersey out of the corner of my eye. I thought to myself, ‘nice, a New Yorker!’ I take another look, and realize that “New Yorker” is actually Mary Whittenberg! I was running among a NYRR celebrity! I decide to make my way into the conversation she was having with another runner from our area. The rest of the run, from then on out was pure enjoyment. The three of us continued on with our conversation and 8 minute miles. Never in my life had 13.1 felt so quick and easy (Editor’s note: Leah’s time-1:44:46). I had the best time ever, and finished day 1 with a big smile on my face! 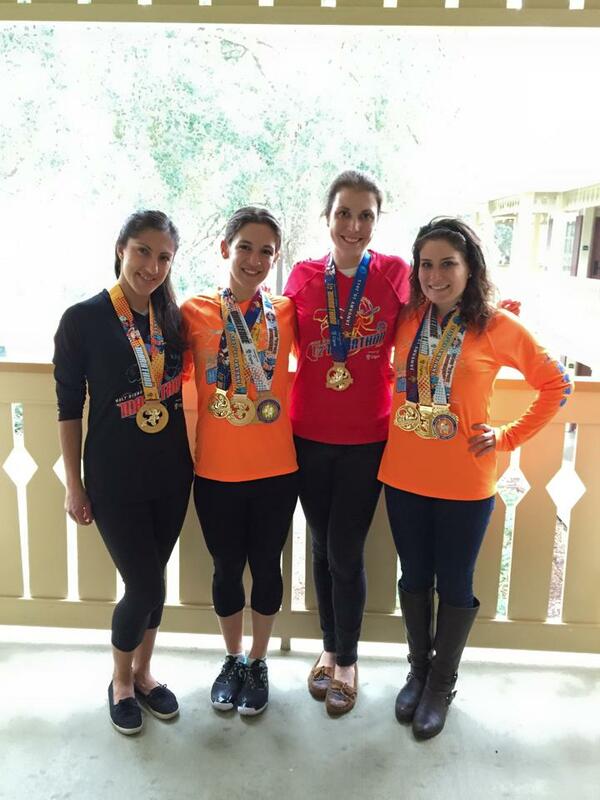 After the race I met up with the other girls, and we went back to the hotel for some foam rolling and stretching. We wanted to spend the day off our feet, so we went to the movies. Originally, the plan was to hang out by the pool, but unfortunately it wasn’t quite warm enough for that. 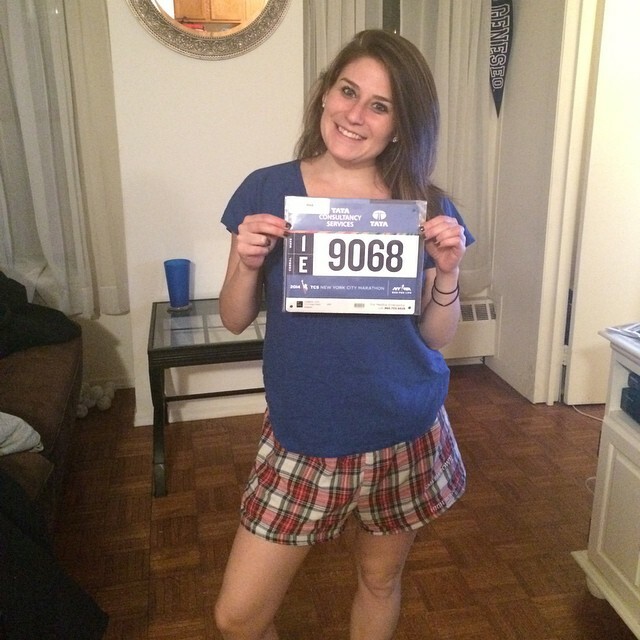 Day 2 also begins at 2:45 am, this time it’s me, Francesca and Meredith [Nadler] gearing up for the full marathon. To this point I really wasn’t sure what my goal pace was going to be. I mainly wanted a nice comfortable long run pace, and no injuries! Getting to the start again was very easy, and this time it was a little bit warmer. Deja vu, the fireworks for our corral go off and we start running! I settle into an 8:20-8:30 pace and feel good! At this point I’m thinking that I would be very happy to finish around 3:40. I thought that would be very reasonable, and hopefully wouldn’t feel too painful. Running the full was so fun; I had no idea what to expect, and was pleasantly surprised. We ran on the race car track, a baseball field, an actual track, and of course through many of the parks. After mile 9 I look down at my watch to realize that I’m averaging quicker miles, which I’m fine with because I feel really good! I also see the 3:35 pace group. I figured it would be nice to have a group to run with so I stick with them for a little while. During my time running with them I did a couple sub 8 minute miles. Picking up the pace a little actually felt really great. By the half marathon point I separated myself from them and continued solo till the finish line. My miles were consistently between 7:40 and 8, and my overall pace was coming closer and closer to that 8 minute mile (which would have been a 3:30 marathon). Before the race I didn’t think that breaking 3:30 after running a half, and not really “training” was doable, but by the time I reached mile 18 I felt as though it was in my reach and decided to go for it. The rest of the run did feel hard, but nothing excruciating. I took my gels, drank some Poweraid and continued on. That 3:30 finish was by no means a sure thing, so I had to stay strong. Coming up to mile 25 I barely realized we made it back to Epcot. Not sure how I missed it, but was happy when I came to! This mile hurt, a lot, but I knew I was almost done with my 39.3 mile journey. I come up to the finish where I spot Alex, Kaitlyn [Kiernan] and Francesca (who finished 15 minutes earlier !) and sprint towards the line. Happy to say I finished with a 3:29:58, and really happy that the last mile and a half was done in under a 7:30 pace! The weekend was perfect. I had so much fun “run-cationing” with my Whippet crew, and feel so lucky to have had this experience! I look forward to more fun running adventures in the future, and definitely recommend the Goofy Challenge if you’re into that sorta thing!